Use this guide to match your NI Digital Instrument Models PCI, PXI, PCIe, and PXIe devices with a compatible cable and accessory to meet the needs of your application, replacing or expanding your current configuration, or verifying that existing parts can be used in a different configuration. This guide includes cable and accessory compatibility for NI Digital Waveform Instruments (HSDIO), NI Digital Pattern Instruments, and NI High-Speed Serial Instruments. Digital Instruments including NI Digital Waveform Instruments (High-Speed Digital I/O), NI Digital Pattern Instruments, and NI High-Speed Serial Instruments generate and acquire high-speed digital waveforms for transmitting data, communicating with devices under test, or testing digital interfaces. These instruments are ideal for semiconductor characterization and production, interfacing to LVDS and TTL digital electronics, and testing the functionality of high-speed serial links. Identify your device or module. This guide covers a broad range of configurations, to stay concise, it is not intended to cover every potential combination or use case. The most common and recommended solutions are presented. Configurations with known limitations are noted. This guide is intended to cover current, legacy, and recently obsoleted NI HSDIO hardware devices, and their cable and accessory options. It does not cover long-time end of life (EOL) NI HSDIO products, and does not cover EOL cable or accessory options. The guide is not intended to cover cable or accessory options for other NI hardware families such as RF, Source Measurement Units (SMUs), Switches, DAQ, C Series, or R Series. To find more information about other NI Digital Instrument accessories and general information that applies to all Digital accessories, visit the Digital Instrument Accessory Guide Main Page. To find more information about NI Digital Instrument cables and general information that applies to all Digital Instrument cables, visit Digital Instrument Cable Guide Main Page. To create your own cable or test fixture, or to repair an existing NI Digital Instrument cable or accessory, visit the Digital Instrument Custom Cables, Replacement Connectors and Screws Guide. Some cables or accessories from other NI product families may share the same connector or visually appear the same, but typically come with limitations, incompatibilities, or safety concerns. For this reason, unless expressly mentioned in this guide, compatibility with other NI cables and accessories are not covered in this guide and are not recommended. These pages are arranged by first having you identify your hardware model and then choose the accessory or cable combination that best fits your needs. PXI and PXI Express (PXIe) modules: Model numbers are typically found at the top of the faceplate of the card. Click here for an example. If you've already installed NI Measurement & Automation Explorer (MAX) and the device driver, complete the following steps. Use the following tables to locate your device or module. Once found, note your connector type, pin count, and any other notes for reference. Next move to the Cable and Accessory Compatibility Tables. Identify your Infiniband connector device or module, then click to jump to the compatibility table. Identify your High-Speed Serial device, then click to jump to the compatibility table. 1 Cable is offered in 0.5m, 1m, Low Leakage 1m, and 2m. For more information on Low Leakage Cables see Glossary. 2 The 653x Cable Adapter is designed for use with the PCIe/PXIe 6535/6/7, the PCIe 6535B/6B/7B, the 654x series and the 655x series. It has not been tested and is not recommended for use with other NI products. If you plan to use the 653x Cable adapter please see the Known Limitations and Issues List. Use this table to identify compatible Infiniband connector cables and accessories. Use this table to identify compatible Digital Pattern Module cables and accessories. Use this table to identify connectivity options for High-Speed Serial devices. 3 The PXIe-6591 has both a Mini-SAS and VHDCI Connector. It requires a compatible cable and/or accessory for each connector. This section is important to review because not every cable and accessory combination allows access to the full functionality of your NI Digital Instrument device or module. This list contains notes about known limitations when using certain combinations of HSDIO cables and accessories. If your device or cable is not listed in this section, there are no known exceptions for it. Can be used with the 653x Cable Adapter to enable compatibility with SCSI accessories. Without using this adapter the devices must be used with VHDCI accessories. The SCB-68 and SCB-68A must be configured in Direct Feedthrough Mode. For more information on how to configure these accessories in Direct Feedthrough mode see the SCB-68 and SCB-68A Accessory guide. Review this table for alternative accessory options. 653x Cable Adapter VHDCI and SCXI pinouts are a direct pass through except for the Trigger and Control lines. These lines will need to be connected by use of the Screw Terminals inside the backshell of the cable adapter. 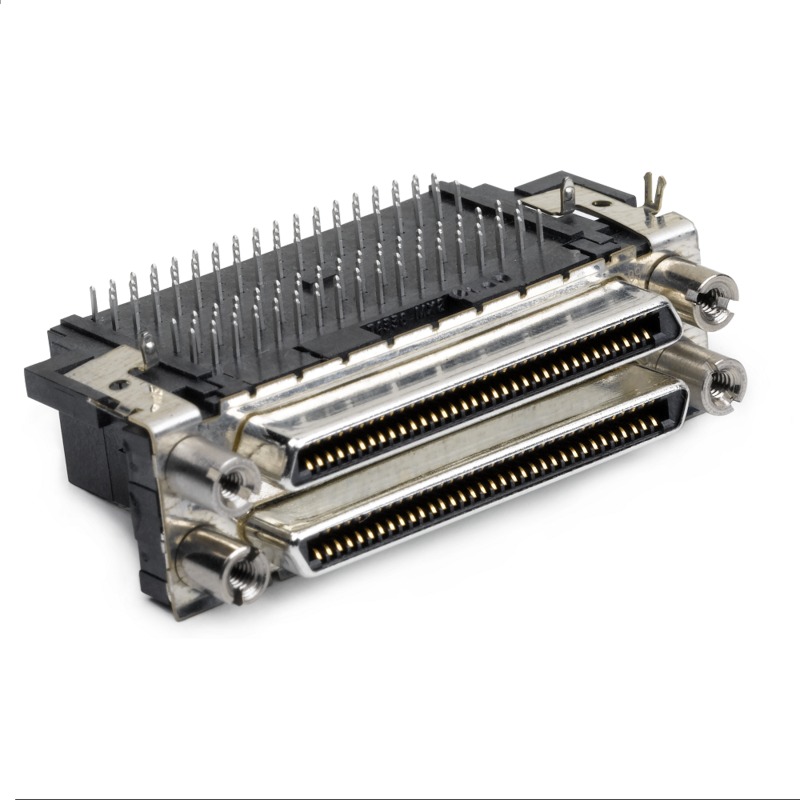 SCSI 0.050 D-Type - Industry standard SCSI connector standard featuring 0.050 pin spacing that is used in 68 -position HSDIO cable and accessory connections. Click here for an example. Dual Stack - Two combined connectors stacked onto each other on a PCB-mount connector. Each connector accepts its own cable. Click here for an example. Flying Lead Cable - Shielded cable that breaks out single ended signals into two 0.1 inch header receptacles, one receptacle each for the signal and ground. Used for direct connectivity to 0.1” pitch header pins or probes. Click here for an example. Low Leakage Cable - The PCB surfaces of low-leakage cables are cleaned of contaminants during manufacturing, reducing induced current leakage. When purchasing an NI HSDIO device or module, for ease of use, the cables and accessories are listed on the product selection page. To begin browsing NI HSDIO devices and modules, visit ni.com/digital-instruments/. You may also purchase your cables and accessories separately. Click here to browse cables and terminal blocks for NI HSDIO devices and modules.